Since we love food around here, especially fruit and vegetables in season, we eagerly look forward to three sings as summer rolls into August: corn, peaches and tomatoes. For the corn, we want it fresh out of the field with tender kernels and a sweet taste. We don’t care what variety it is, just that its fresh and sweet, and of course, tender. For the peaches, we want them either off our own tree in the back corner of our yard (none this year sadly, because of a late frost) or picked a day or two before down in the orchards of Niagara and at their peak of perfection. I like to slice them up to eat them. We also have a quick, easy and mega-great peach kuchen recipe which is a treasured memory of my mother. Over the years we’ve made hundreds of these things. You can find the recipe by clicking HERE. But for me, I wait for the tomatoes. We grow beefsteaks (Big Beef), cherry tomatoes (Sweet 100) and San Marzanos. Even with only nine plants, on a good year, we get snowed under. Thing is, tomatoes are only worth eating when they’ve been vine-ripened. They’re best when they haven’t been refrigerated (ever!) and for me, I like them still warm from the afternoon sun. This year, even considering how cool our evenings have been (the essential thing to get your tomatoes to really ripen perfectly), our crop is really outstanding, huge perfectly ripe and flavorful fruits. This is what tomatoes are all about! Off-season, tomatoes are not worth buying (at least in North America). 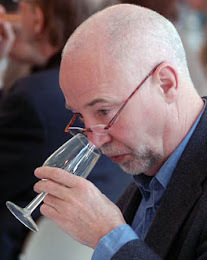 Even the “vine-ripened” ones are a joke: thin tasting, not sweet, mealy or still hard. The tomato industry is only interested in tomatoes that last for a long time, look good and transport well. Taste? That’s way down on their list. Ready for the table. Yum! I’ve ranted about this before, so let’s not beat a dead horse. The best tomato is one right out of the field, or preferably your own garden. Period. We will forgo tomatoes the rest of the year and live for those 6-8 weeks where we have them at their peak. And for us, that’s right now. One of our favorite ways to make them is grilled. There’s little that’s better than slicing a big one in half, sprinkling it with some herbs, spices and raining down a bit of bread crumbs before popping it under the broiler and cooking it until it browned and a tiny bit shriveled. If you started with tomatoes at room temperature, they’ll be nicely warmed through. With some grilled meat, you’ve got a match made in heaven. 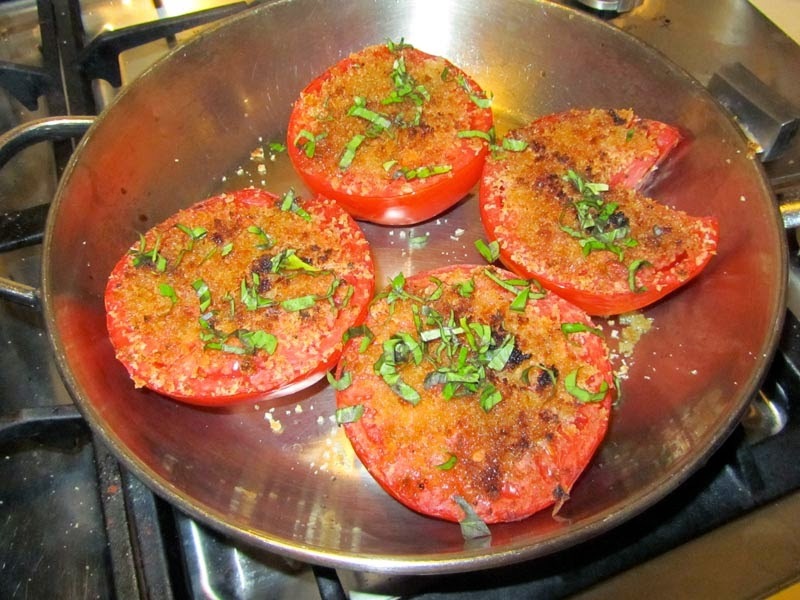 So without further ado, here’s our grilled tomato recipe: quick, easy, and absolutely delicious! Cut the tomatoes in half longitudinally. Cut the stem portion away on the top piece, and the flower stub away on the bottom piece (if it’s there). Place them cut side up in a baking pan, an oven-proof frying pan or just make a tray out of aluminum foil. Sprinkle the top of each tomato with granulated garlic, a bit of salt and a good grinding of black pepper. I usually sprinkle about a half teaspoon of Worcestershire sauce on each one. 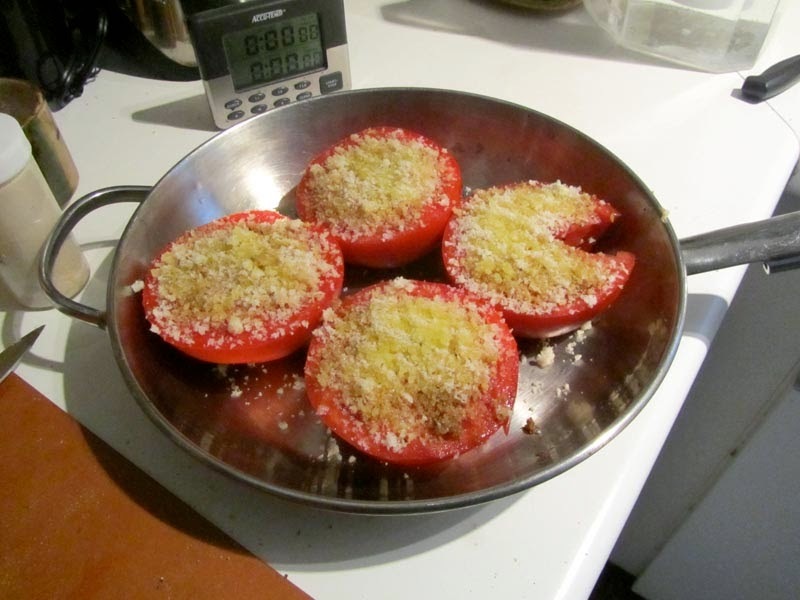 Put a good bit of breadcrumbs on top of the tomatoes next and then drizzle on some good quality olive oil to finish up. I find it best to put the tomatoes in a 350° oven for 10-15 minutes. Quite often I’m using the oven for some meat, so I remove the tomatoes, cook the meat (steak or pork tenderloin anyone? ), then while it rests, you can pop the tomatoes under the broiler until the bread crumbs toast up nicely. Just before serving, thinly slice some basil leaves and sprinkle them over the top of the breadcrumbs. Serve these piping hot! And that’s it. With perfectly ripe tomatoes, this is a dish you’ll dream about for the next ten months until the tomatoes are ripe once again.